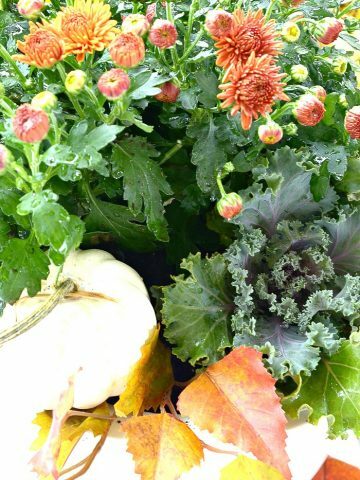 Mums are part of the fall decor, here at StoneGable. They live a long time with little care and are very inexpensive. And when they are taken out of their plastic post and combined with other plants or organic elements they are magically transformed! This is certainly a study in synergy! I added asparagus fern to buddy up with the mums. The frilly fern spilling out of the champagne bucket plays very nicely with the upright busy mums! 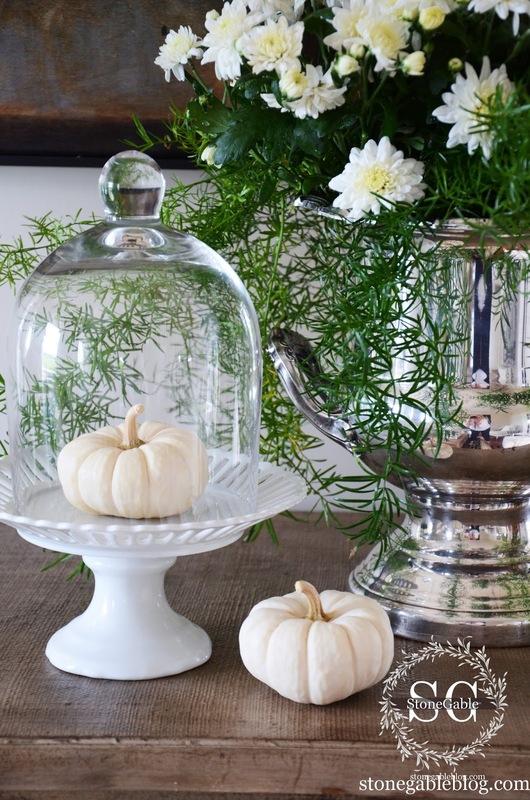 To make a vignette I added a baby boo pumpkin in a cloche! 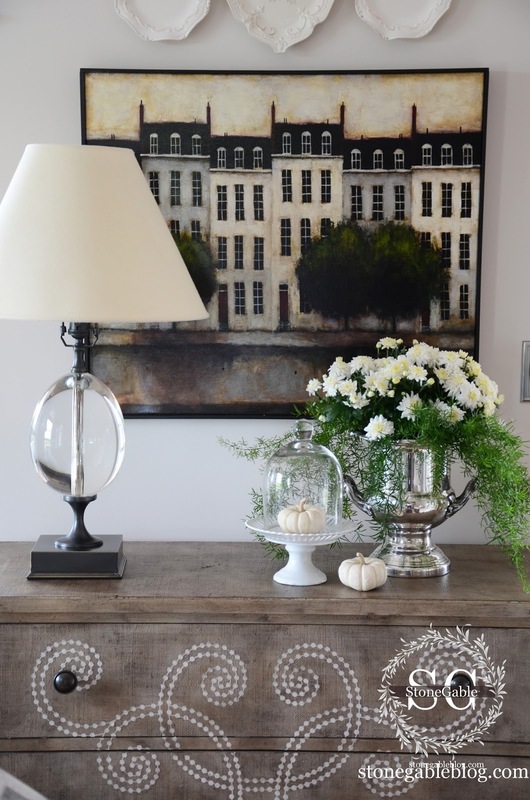 I’m just bringing touches of fall to my decor… not too overdone! In years past every surface was overloaded with fall or the upcoming holiday. I think a just a little of the season works better in my house now! 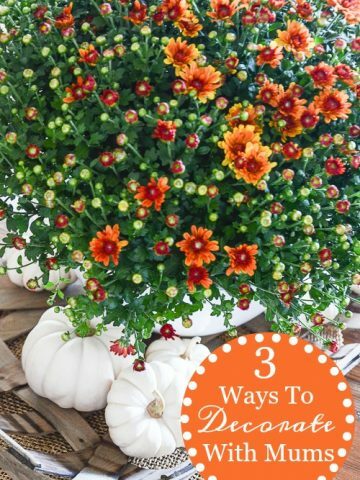 Think outside the black plastic containers… and let you mums shine this fall! Have to agree with the other comments the champagne bucket is a fantastic and classy idea. How lovely is the white mums with the silver. Very classic and classy, just my style. Oh, but how adorable are those baby boo pumpkins? ! 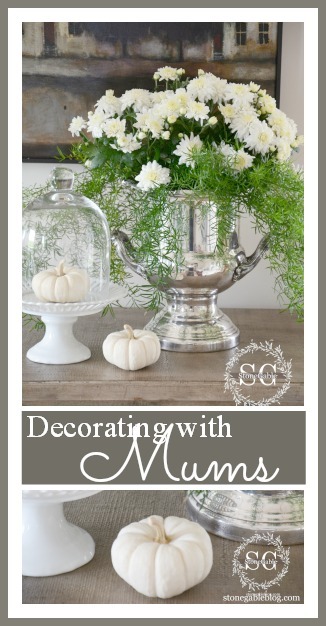 Mums + Silver = Gorgeous!! LOVE it! 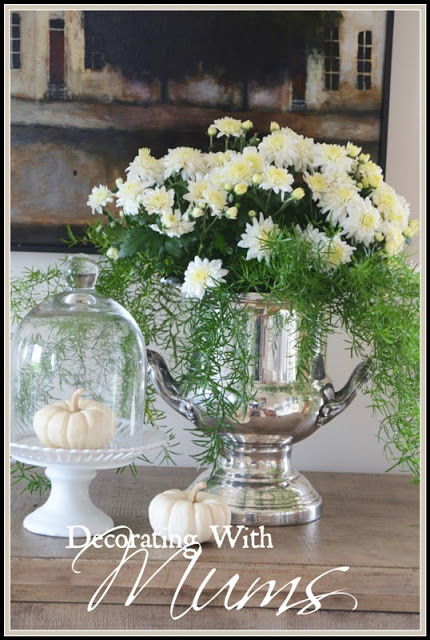 I can see splendid beauty all around your warm and cozy living space.I love the special touches you have added to your home.This mum vignette is perfect to welcome fall..
Love how the mums and the fern work together in the urn, beautiful! Beautiful, Yvonne. I love the addition of the asparagus ferns with the mums! Sooo pretty, I love that bucket! Really liked the glass bottle and the flower pot aside of that. They collectively give a vintage look to your interiors. The design of the glass bottle is quite awesome. All of it looks perfect. 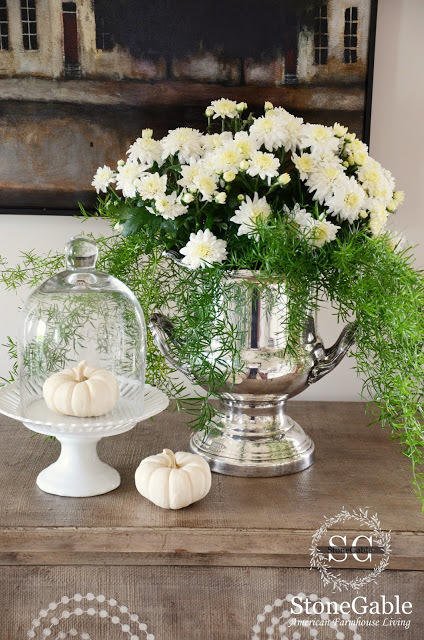 I haven’t seem the asparagus fern with mums before and the pairing looks wonderful, especially with the white petals and pumpkin. Great styling too! 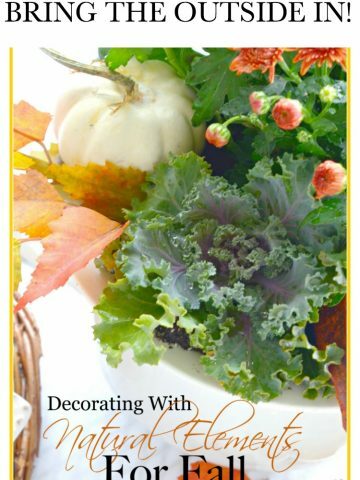 Hi Yvonne, I love the simplicity and the clean lines of your autumn decor. Can you please tell me about the beautiful artwork hung above the dresser? You have totally turned me into a ” creamy/ white-beige neutral chic”,. You can work that color like no other!!. Lol,.. I’m loving each and every thing you put out. You can make the simplest thing so rich and classy! Thanks for sharing and keep up the awesome talent you have! Very pretty Yvonne! 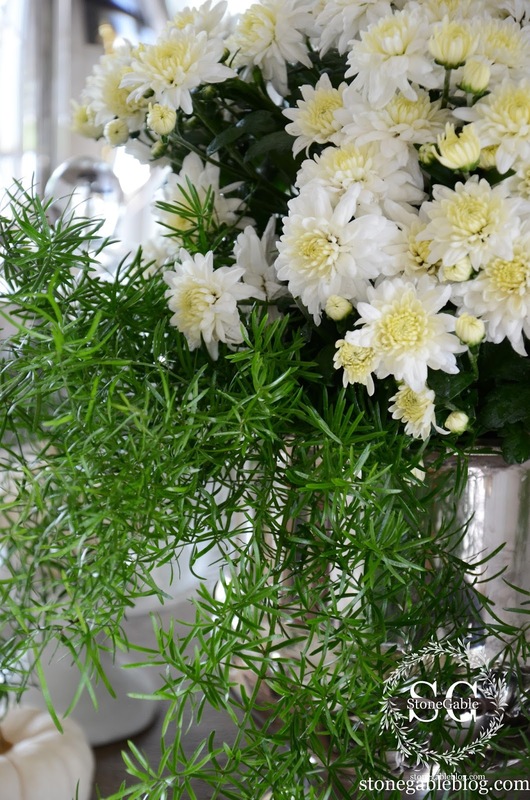 I like the asparagus fern mixed with the white mums. 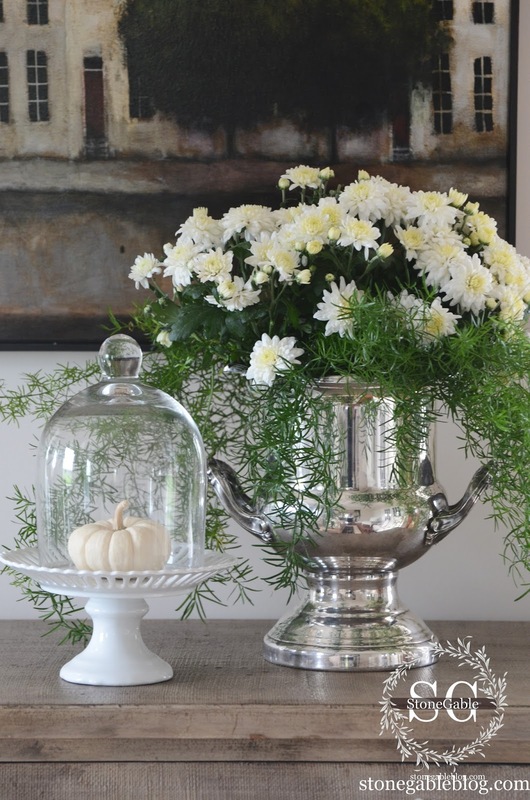 The cloche on the white pedestal piece with the pumpkin looks cute next to the mums. Great vignette! Great idea! I love your approach to fall decorating. I did the same last year and I loved it well into November which worked great for Thanksgiving as well. I love the look! Simple yes, but understated is elegance. Love the pumpkins in the terrarium, too! I agree, I’m not getting all my fall things out this year either. Your so lucky to have found the white pumpkins. I’ve never seen any where I live and we don’t even have the orange ones in our stores yet. This is a very pretty look for your home, Yvonne. I like the use of whites in your home. The silver champagne bucket is gorgeous! From one Yvonne to another: I love your posts! Wish you made house calls! I’m getting do much inspiration from you and hope that my family and guests find my house as warm as I find yours. Thanks again for all the beauty that you share with us. So lovely, understated and elegant. THANKS !! LOVE IT !! I’ll be posting that on Monday, September 23rd. I think you will like it! Very elegant and so ‘Yvonne’! For some reason. I never have luck with mums, which is unfortunate because that results in a pretty barren Fall landscape. :(. Can I borrow your green thumb? Beautiful Yvonne, Eddie Ross led me in the direction of loving mums! Love yours in the beautiful Shining Champagne bucket! I like what you said about less is sometimes better. Over the years I too have loaded down tables, fireplace, etc. but that was also a time when my daughter was young and loved all of the colors and decorations. As I get older, I like decorating with less and I do believe it is a much more elegant look….and it makes the same statement. 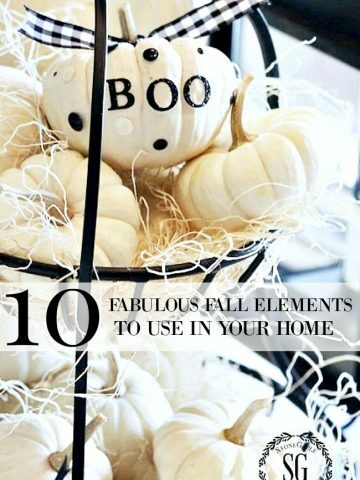 I try and stay away with “Halloween” decorations and focus on fall items only. Your mums are very pretty and the champagne bucket just sets it off…..
love those little white button mums with the asparagus fern, I’ve never tried “the buddy system”, they look perfect in that champagne bucket!! I love the combination of the mums and fern. And I spy with my little eye 🙂 some beautiful dishes you hung above the picture. I love the look! On a completely different subject, I wanted to thank you for your faithfulness and enthusiasm for The Lord. I love your Sunday scriptures. I have read the “volunteers” story to several people. It is so amazing how God reveals things at just the right moment. So anyway thanks and please don’t ever stop blogging, the word. Beautiful! LOVE the champagne bucket! This is not your same-old, same-old mum arrangement! I love it! Very beautiful, indeed! Very, very pretty Yvonne! So simple and so lovely – as always. Gorgeous, Yvonne! I love your baby boos and how you showcased one under your cloche. Such a beautiful vignette, and I love the fern spilling out of your silver champagne bucket, too! Happy Fall! They look fab in the silver bucket. 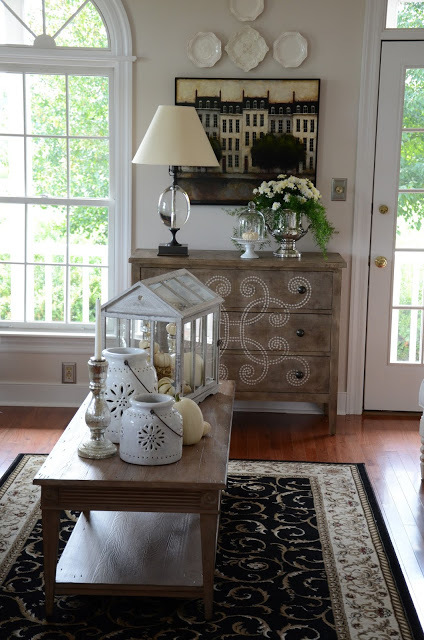 Beautiful Yvonne your mum vignette is perfect for fall. So beautiful Yvonne. I have been searching for a silver champagne bucket for a while, because of a post you did a while back with flowers in it. Such a lovely way to display a floral arrangement. Oh so pretty. What a beautiful vignette.